To Strengthen the Body, Mind, and Spirit! San Antonio Dojo training is conducted on Tuesdays from 6:30 pm to 8:30 pm at 9315 Broadway, San Antonio, TX 78217 (We rent a dance floor area at the Blue Bubble Ballrom). 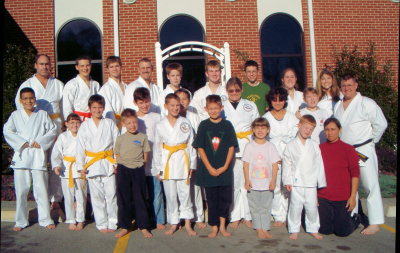 Visit the Waynesville, MO dojo website HERE. Welcome to the American Bujutsu Institute Website! 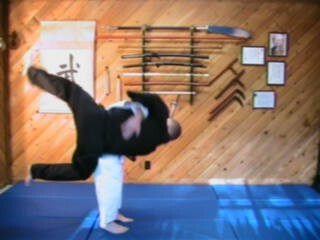 What martial arts style does the American Bujutsu Institute teach? The ABI teaches Tenshin Shoden Ryu Karate-Do*. Tenshin Shoden Ryu Karate-Do is a Japanese-style martial art that can be translated to mean "The school of the divinely inspired way of the empty hand," and is best described as an eclectic combination of Karate, Aikido, Judo, Jujutsu, and Kobudo. "Tenshin Shoden" literally means heavenly, true, correct tradition that is divinely inspired. "Ryu" literally means school, tradition, or system of training. And "Karate-Do" literally means "the way of the empty hand". Tenshin Shoden Ryu Karate-Do incorporates the teachings of Christianity (as opposed to Buddhism or Shintoism), and is based on the principles of water. Tenshin Shoden Ryu Karate-Do is not a new system or style of martial art; it is simply the combined ancient teachings of the arts listed above (many of which are now rarely taught in the classical forms) with the added central theme of Jesus Christ and the added philosophy of the water principle. Tenshin Shoden Ryu Karate-Do has a very strong base with obvious influence from Shotokan Karate-Do. Shotokan Karate-Do, founded by Gichin Funakoshi, is considered by many to be one of the best Karate systems in the world. In fact, Funakoshi Sensei is considered by many to be the father of modern-day Karate. Although most people believe Karate to be Japanese in origin, it is not. It is actually Okinawan in origin, and was taken to the Japanese mainland by Funakoshi Sensei. Over the past one hundred years, numerous other systems of Karate have been founded, but the majority of them can be traced back to Shotokan Karate. What is the mission of the ABI? The mission of the ABI is to promote the martial arts in a Christian atmosphere. In addition, we intend to promote the "trilateral whole-person concept": mind, body, and spirit. Many martial arts schools focus only on physical development, and leave out the mind and spirit. This, in the opinion of McLendon Sensei, does not provide complete training. Others promote mystical religions, and this is contradictory to the teachings of the Holy Bible. The ABI uses the Holy Bible as the basis for the moral and ethical teachings, and Jesus Christ is the Master. We wish for the promotion of ethical principles, integrity, and discipline in all walks of life. The young people of today are the leaders of tomorrow, and if they are taught the important principals that made America great, they can truly make the world a better place for everyone. What is the motto of the ABI? The motto is: "To strengthen the mind, body, and spirit." What is the rank structure of the ABI? The ABI has 10 Kyu grades and 10 Dan grades. The colors used for each are as follows: 10th Kyu (White Belt), 9th Kyu (White Belt), 8th Kyu (White Belt), 7th Kyu (Yellow Belt), 6th Kyu (Orange Belt), 5th Kyu (Green Belt), 4th Kyu (Green Belt), 3rd Kyu (Brown Belt), 2nd Kyu (Brown Belt), 1st Kyu (Brown Belt). All of the Dan grades wear a solid black belt. Although many Japanese and Okinawan systems also use a red and white or a solid red belt for higher Dan grades, Tenshin Shoden Ryu Karate-Do does not. We do, however, recognize those ranks when worn by members of other organizations. Although we do have the ability to eventually promote to 10 Dan grades, the highest ranked person in the system today is a Yondan (4th Dan) and is not currently eligible for promotion. How long does it take to attain the rank of Black Belt? It generally takes a person between four and six years of dedicated training to attain the rank of Black Belt. The Black Belt rank, however, should not be the ultimate goal in martial arts. Achieving the rank of Black Belt is actually only the beginning. In Tenshin Shoden Ryu Karate-Do, the attainment of the Shodan rank, or First Degree Black Belt, actually represents a dichotomy. On the one hand, all Dan grades in this system are qualified to teach, run their own dojo, and are referred to as Sensei. However, on the other hand, the attainment of this rank actually means that the recipient is now ready to start their journey; receiving a Black Belt is really only the beginning. What is the background of Jason McLendon, Sensei? 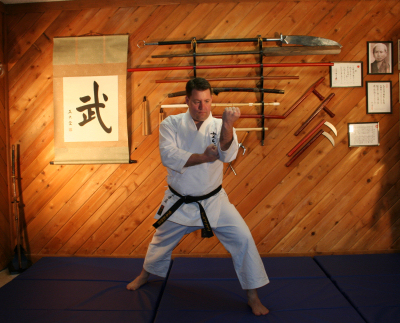 Jason McLendon, Sensei, has practiced martial arts for over twenty-seven years. As a military dependent, he lived in many locations around the world and had the opportunity to study and receive ranking in several martial arts. His highest rank, as a Karate Yondan (4th Degree Black Belt) was received from the World Butokukai Federation and the All Japan Karate Union. He is also a member of Karate for Christ, International. Prior to the American Bujutsu Institute, McLendon Sensei ran three other successful businesses, including two Karate dojos (both of which are still in operation) and a private security agency. In addition, he co-founded the nationally acclaimed Community Anti-Terrorism Training Institute, a non-profit corporation. McLendon Sensei spent approximately ten years in the US Air Force as an Anti-Terrorism Officer and Police Officer, including serving as the commander of a military SWAT Team. His civilian experience includes serving as a Police Officer, Private Investigator, and Executive Protection Specialist (Bodyguard). In addition, he is a Hostage/Crisis Negotiator, an Emergency Medical Technician and holds the coveted designation as a Certified Protection Professional from ASIS, International. He received his BS in Justice and Public Safety with a specialization in Security Administration from Auburn University at Montgomery and his MA in Business and Organizational Security Management from Webster University. What is the American Martial Arts College? The American Martial Arts College (http://www.amaconline.net), or AMAC, is a future educational program that will offer actual martial arts college degrees. The AMAC will be a full-time martial arts training program for high school graduates who wish to pursue a career in teaching martial arts. The program will consist of both a residential and/or distance learning platform. All of the residential students will live in dorms with other AMAC students, and will live, eat, train, and study together for four years. During this time, students will also attend a local university (for core education requirements) and graduate the AMAC program with an accredited Bachelor of Arts Degree in Martial Art Studies, as well as with a Black Belt in their chosen discipline. During the program, students will also be familiarized with other Japanese, Chinese, and Korean martial arts, as well as briefly studying western martial arts. *The "Tenshin Shoden" in our style's name is not a derivative of, nor can the system be traced back to, and neither are we affiliated with any other organization using "Tenshin Shoden" in their name. We are not affiliated with the Tenshin Shoden Katori Shinto Ryu, the Tenshin Shoden Shindo Muso Ryu, the Tenshin Shoden Mugai Ryu, nor any other Ryu using these terms that simply mean "divinely inspired." Copyright © 2005 American Bujutsu Institute. All Rights Reserved.